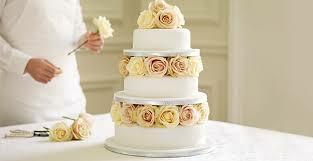 Choosing your wedding cake can be one of the most delightful parts of planning your wedding. However, there are many aspects that need to be considered, including design, flavours, size and budget. Design – Do your research using the internet and bridal magazines. Pick out a few designs that match your theme. You could also mix and match designs to create something original. Budget- If you’ve got your wedding planned, you would have a rough idea of what you are able to spend on your wedding cake. Make sure your bakery is aware of your budget. If your bakery is unable to work within your budget, ask them for pictures of wedding cakes they have created in the past. You might get lucky and find something that you like, which is within or below your budget. Size- If you’re planning on an intimate gathering with 100 of your family and friends, you could opt for a cake with lesser tiers or dummy tiers. Although dummy tiers are still costly, they are still cheaper than actual cake. If you are on a very small budget, select a small cake and serve your guests a mini version of your cake in the form of cupcakes. Flavours- Guest will remember a pretty cake, but what will make your cake memorable; will be its taste. Make sure you ask for samples of all the flavours you and your partner like. If you like 2 or 3 flavours, you could include different flavours for each tier.